What Do We Know About Public-Private Partnerships? In the past, much of the public-private relationship research has been ideological. Researchers at conservative think tanks often have heralded them, while the public administration community—given its public sector origins—has been somewhat skeptical, often justifiably. The challenge for researchers is to depoliticize the debate and begin to document where public-private partnerships have worked—and not. In Move, Kanter sorts out the important distinction between privatization and public-private partnerships. All too often, commentators have equated the two, though they are clearly different. The lack of an agreed upon language has hindered discussion about the private sector providing or partnering to provide public services. Based on her research and real examples, Kanter describes privatization as getting “out” of a public service by finding private owners for public assets and thus raising cash. In contrast, she argues that public-private partnerships have the potential to combine private investors and public funders to tackle projects too large for either one to handle alone. Given constrained budgets at all levels of government, finding new funds and funding mechanisms is even more crucial. Move focuses on the challenges confronting the United States’ transportation sector, the one with the most experience with developing public-private partnerships and exploring alternative funding arrangements to support large infrastructure projects. Kanter describes the private sector’s success providing freight rail services, as the nation’s passenger rail service continues to face many problems. She also examines the nation’s airlines and highways, as well as the move to “smart” roads and cities. Success stories are woven throughout Move. One is the Port of Miami Tunnel, a 30-year effort to get trucks off local roads—which created severe traffic jams—and into a tunnel that would move them from the port directly onto highways. Kanter describes the journey to complete the tunnel, a tale of ongoing negotiation and compromise among local, state government and national governments and private sector companies. The journey was indeed a difficult one that included a change in private sector partners at a crucial point. Following several construction stops and starts, the tunnel opened in August 2014. Based on her analysis of the public transportation sector, Kanter concludes that the public sector needs more tools to meet 21st century challenges. While focused on transportation, her conclusion applies to other public activities like social services, housing and education. She argues the nation can no longer simply rely on funding infrastructure through municipal bonds. The public sector must develop and experiment with a variety of new tools, including public-private partnerships. Kanter documents privatization initiatives in Chicago and Indiana that ultimately did not work well. Her critique of these initiatives is based on research, not ideology. More of this type of critique and analysis is needed. Infrastructure banks are another tool that Kanter recommends for government use. Both Asia and Europe have developed strong ones. She discusses creation of a Chicago Infrastructure Trust that could serve as a model for other local infrastructure banks. Move also shows the need for a more effective U.S. intergovernmental system. Looking toward the future, Kanter writes, “A strategic national framework could jump-start action on transportation infrastructure by reducing uncertainty and making the priorities and rules clear, thereby opening the way for innovation.” This national strategic framework, she writes, would be implemented by regional (often metropolitan) planning groups. More research is warranted for how regions work with state and national governments to put funding together for future infrastructure improvements. Move: Putting America’s Infrastructure Back in the Lead is a very important read for the practitioner and academic communities. For the former, Kanter shows how they make government work—often in conjunction with the private sector—in the transportation sector and in a way that can be replicated more broadly. For the latter, Kanter shows the type of research needed to explore new tools for the public and private sectors to work together. Author: Mark Abramson is president of Leadership Inc. He previously served as executive director of the IBM Center for the Business of Government and president of the Council for Excellence in Government. He is co-author (with Paul Lawrence) of What Government Does: How Political Executives Manage and Paths to Making a Difference: Leading in Government. 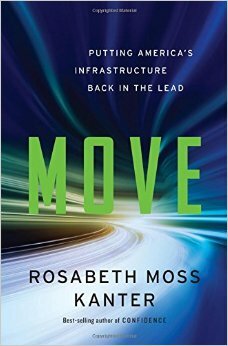 Move: Putting America’s Infrastructure Back in the Lead (2015) is published by W.W. Norton. One Response to What Do We Know About Public-Private Partnerships? Mark, thanks for bringing this important topic to the forefront with your review. Virginia DOT has been experimenting on how to get critical roads built using various partnerships.